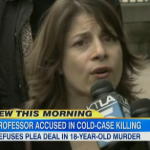 Dan appeared on Good Morning America this morning to discuss the case of Norma Patricia Esparza, a respected college professor accused of aiding in the murder of a man that occurred 18 years ago, while she was in college. While Esparza admits she had a strong motive for killing him, she maintains her innocence. Reports Dan, “They believe that they can prove she was part of the plot and that they basically scoped this guy out, they went back to the bar a few times to try to find him. Prosecutors would say this wasn’t just a situation where they happened upon him and then suddenly this team of people went after him. They’re saying there was this plot and that she was part of it. If they can prove that, she’s in trouble but that’s going to be the big question.” Watch the entire clip here.